The holidays are piled up at the end of the year like an obstacle course with a high potential for causing injury, and I approach them as such. When January 2 comes around and I discover that we’ve survived them all relatively intact, I cross myself and breathe the proverbial sigh. Here in the United States, the whole mess begins with Halloween. This year, thankfully, no one was lost in the corn maze or sliced off a finger while carving pumpkins, and no one bit into a razor blade hidden within a looted chocolate. I remember how terrified I was of this happening to me circa 1979. It wasn’t long after this past Halloween, however, that I was hit from behind while driving to work. I escaped injury and any liability for the accident but my little commuter-mobile went into the shop for more than a week and over $3,500 in repairs. This year we celebrated Thanksgiving at our home with my parents and my sister and her family. It was crowded but warm. The bird was roasted to perfection and everything was going along like a holiday card until my daughter decided to chip her (permanent) front tooth on, of all things, a bongo drum. There were tears, tears, tears, but after a few days and a trip to the dentist all was well again. During this quiet but vaguely threatening lull that separates Thanksgiving from Christmas, we’ve so far been spared any really horrible disasters. My son did frighten himself into a two-day bout of insomnia by reading Hound of the Baskervilles, and the cat has launched an encore performance of her role as vomit-artist. But we got the tree into the house and decorated it without incident. If our luck holds, we’ll pass under the razor wire of Christmas Eve with nothing more than a few scratches and emerge a week later from New Year’s Day with little worse than a headache. At any rate, I’m signing off for the remainder of 2013. I’ll be back again in January, if I’m still living. Thanks for reading, and happy holidays. Fans and devotees of Spongebob Squarepants (yes, I’m raising my hand) will recall that while the town of Bikini Bottom itself is located underwater it nevertheless borders a sort of sea-under-the-sea. At the underwater beach Larry Lobster pumps iron and Spongebob and Patrick play inanely in the surf when the mood catches them. One of the more convolutedly comical images you’ll see on Spongebob is Sandy the Squirrel, a terrestrial ex-pat, lying out to tan here while wearing a glass oxygen globe to keep from drowning. Not long ago I learned that such deeps-under-the-deep actually exist. Pools of denser or more saline water may collect at the bottom of the sea, filling in the cavities and contours of the ocean floor and creating subaquatic beaches at their margins. Who knows but maybe these sub-seas themselves contain smaller sub-sub-seas hemmed in by their own delicate necklaces of sand. Moving downwards, each successive body of water is denser and heavier than the one above it. Moving upwards, each layer is thinner and lighter until you reach the surface where the liquid ocean is separated from the gassy atmosphere. Really, if you consider it, the atmosphere itself is just another sea (of air) less dense than the watery ocean below it. What if we too, like Spongebob and friends, live without realizing it at the bottom of a sea? It’s an idea with a surprisingly long pedigree. For hundreds of years, certain people with too much mental leisure have suspected that human beings might in fact be a species of bottom-feeding fish, and wondered about the life of the upper world at the surface above. It goes without saying that any salmon or tuna curious enough to swim into our nets just for the pleasure of seeing such strange (human) fisherman is likely to meet an unpleasant doom. But Fontenelle’s Countess is willing to risk being rendered into sashimi for the sheer transcendence of the experience, and there are plenty like her today who would happily board the first flying saucer that parked itself at their door. Thank goodness for considerate bishops. “It might kill him” because, as Fontenelle agrees above, such sailors-on-the-ether would presumably drown if they attempted to inhale our dense, suffocating atmosphere. Gervase of Tilbury goes on to say that the anchor left behind by the sky ship was still, in his own day, displayed at the church of St Kinarus – but the intervening centuries seem to have misplaced it. The earliest suggestion I can find that humans live and breathe unknowingly at the bottom of a sea comes from the Phaedo. After describing how the Greeks and other peoples of the Mediterranean live like colonies of frogs or ants round a pond, Socrates goes on to say that in fact the world as men know it is only a cavity in the true earth, and that the air and water we know are merely the denser dregs of ether that have settled down from the pure ocean above us. On the shores of that higher, truer world above us, Socrates says, the blessed dwell in celestial cities, they worship in celestial temples, they enjoy celestial pleasures and entertainments. He says that if a mortal were actually to make his way to the top of the sea of ether and gaze into that upper realm, the glorious vision would probably kill him. This judgment is perhaps seconded in parable by events which occurred in the 2004 Spongebob Squarepants Movie, when Spongebob and Patrick, having left behind the base entertainments of Bikini Bottom, find themselves plucked from the shallows by a human seashell collector and nearly scorched to death under a heat lamp. 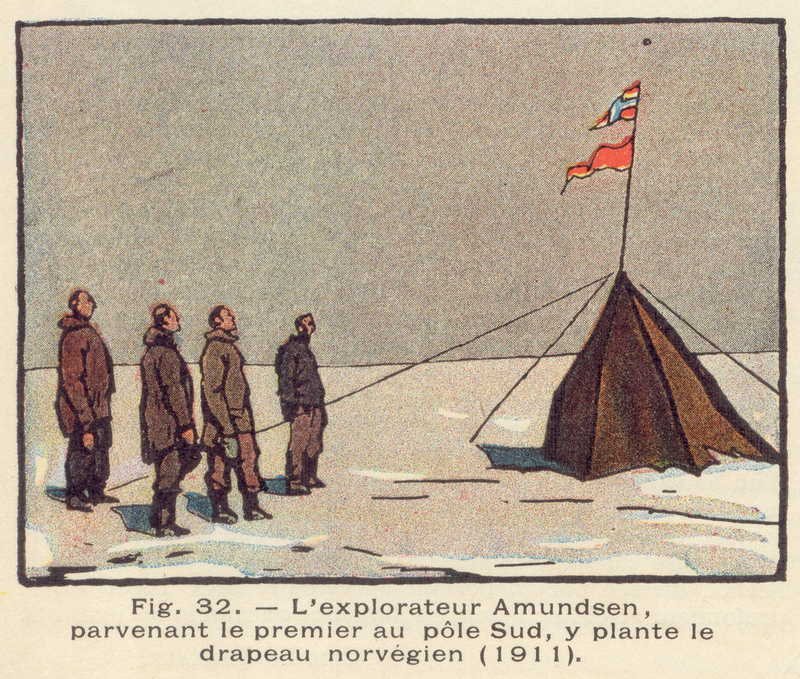 Examining the tent, Amundsen and his men saw that they had been misled by the sporting goods salesman. It would never sleep four comfortably. Christmas season can feel that way when you have more than half a dozen nieces and nephews to buy gifts for, not to mention children of your own, and your checking account plummets with the mercury. Available for the first time in English translation, Professor Borges collects a term’s worth of lectures delivered by Jorge Luis Borges in 1966 on the history of English literature. It’s a remarkable book, I think, for two quite different reasons. It’s remarkable first of all in offering a survey of its subject that will be almost unrecognizable to most students of English literature. Fully a quarter of the course is spent on the Anglo-Saxon era of Beowulf and Co. Almost no mention at all is made of Chaucer and, in fact, seven hundred years of literary history are glibly ignored when Borges leaps directly from the Norman invasion to Samuel Johnson. Milton and Shakespeare are mentioned only in passing. After a couple lectures each for Wordsworth and Coleridge, we’re introduced to a long line of Victorians. Borges spends a really perverse amount of time on Thomas Carlyle, William Morris, Robert Browning, and (of all people) Dante Gabriel Rossetti. He concludes with Robert Louis Stevenson. Modernism he leaves tucked in the womb circa 1895. Second, the book is remarkable because Borges’s style of presentation is no less idiosyncratic than his selection of texts. But there’s nothing to complain about here. It’s a style born of unabashed personal enthusiasm. Literary theory goes out the window (and good riddance) or, rather, it doesn’t so much go out the window as fail to obtain entrance to the room in the first place. Questions about the nature and function and politics of texts don’t seem to interest Borges. Rather, stories interest him. The old, blind Argentinian gets up in front of his students every day and he simply tells stories. He tells whole plots of numerous works. He quotes at length from memory. He tells about the authors’ lives, their absurd notions, unpleasant habits, and frequent misfortunes. Again and again he digresses into alleyways that are sometimes more surprising and more scenic than the view from the broad highway. Never tedious itself, Professor Borges is unrecommendable as an introduction to English literature. It is, however, a wonderful introduction to Borges as a teacher, and it offers a fascinatingly oblique view of its subject for those already possessed of a more orthodox understanding. An Italian author – Giulio Cordara, a Jesuit – has written a poem upon insects, which he begins by insisting, that those troublesome and abominable little animals were created for our annoyance, and that they were certainly not inhabitants of Paradise. My daughter, the budding naturalist, is probably willing to believe that Satan himself invented mosquitoes and those wasps that lay eggs inside the living bodies of caterpillars. But there’s so much joyful precision and adoring detail in a ladybug or a butterfly, she’d rather believe that we were the invading devils of their Paradise.